Today’s the day, North Dakota: Go vote YES on Measure 3! – Cannabistical: of or concerning cannabis. 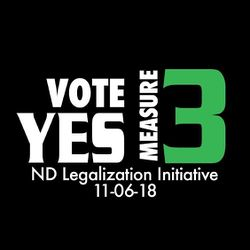 Home » 2018 election » Ballot Initiative » election 2018 » Election Day 2018 » General » Legalization » Marijuana » marijuana news » Measure 3 » ND » news about marijuana » north dakota » Vote » Voting » Yes on 3 » Today’s the day, North Dakota: Go vote YES on Measure 3!